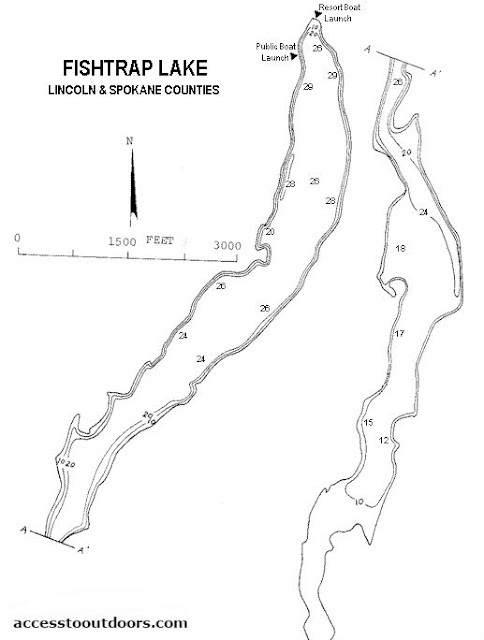 This lake was named after the willow fish traps that the Indians used to catch Red Horse Suckers at its outlet creek. The lake is known for its great trout fishing. This popular Lake is great for boating and swimming. As with all the lakes in the Scablands the lake gets a lot of wind throughout the year so it would be a great sailing lake even though because its narrow you will be doing a lot of tacking. It is long and narrow at 2.2 miles long and 30' deep at its deepest. In the Fishtrap Lake area there are extensive wetlands. 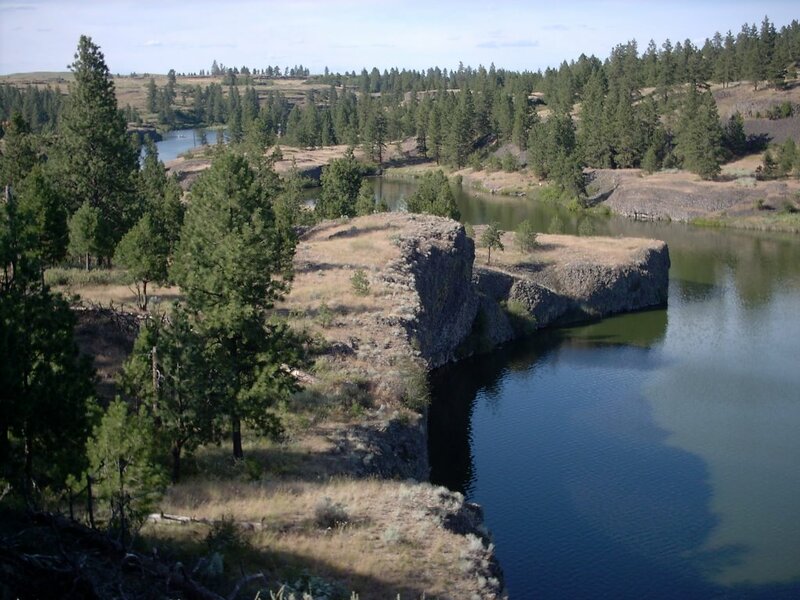 There are numerous trails crisscrossing the area, offering several loop hikes and access to Fishtrap lake and Hog Canyon, wildlife viewing areas. Fishtrap Lake Resort has been on this lake since 1902. It has a nice primitive boat launch that is great to launch powerboats or kayaks from but due to a low hanging cable from a dock to a cliff (clearance from the water is about 8-10 ft) there is no way a sailboat would be able to leave this launch into open water. Luckily there is a public launch ramp right next to this resort that one could launch a deep draft boat or keelboat from. This launch is on an incline so sailors should plan accordingly to step your mast. If you want to use the restroom and docks at the resort you will have to pay to do so. This small resort is privately owned and so paying to use their facilities is a great way to support such a historic resort. If your kids like Buffalo ask the resort manager about it and they may allow you to go see them. Call about services such as camping, boat rentals, etc. 509-235-2284. 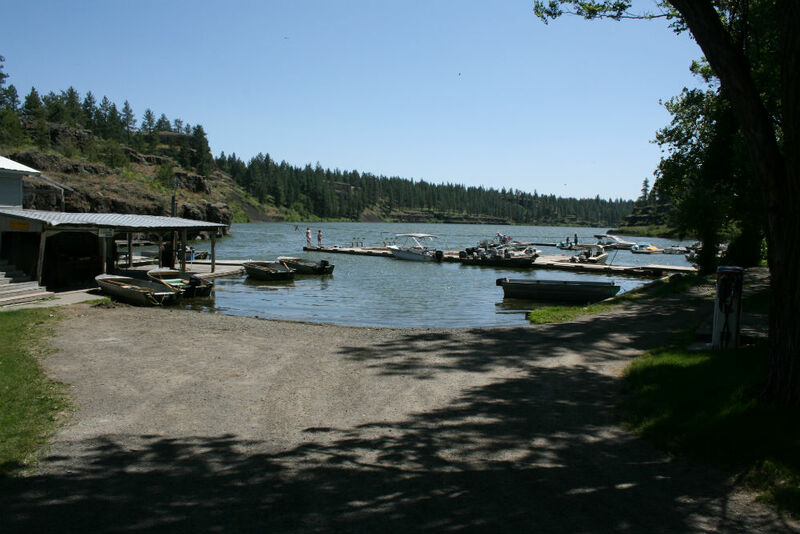 Directions: Fishtrap Lake Resort 509-235-2284. From Spokane go west or from Moses Lake go east on I-90 to Exit 254. Turn south after getting off the I90 exit onto Old State Highway/Sprague HWY Rd E and travel 2 miles. Turn left/east onto Fishtrap Rd. You will descend a hill and will see the lake and resort. This is an old and rustic resort... wonderful place to come and recreate. If you bring your dog you must keep it on a leash. See above text for more resort info or call 509-235-2284. ACCESSIBILITY: PARKING... Gravel dirt combo parking lot; PATHS/TRAILS... None. Launch pavement serves as path to docks and launch; RESTROOMS/FACILITIES… One restroom in resort building. Not ADA accessible. There are picnic areas on the grass, drinking water; SENSORY... No sensory tactile markers for those with visual and other impairments. DOCKS/LAUNCHES/PLATFORMS… Five docks none of which are wheeled mobility devices. 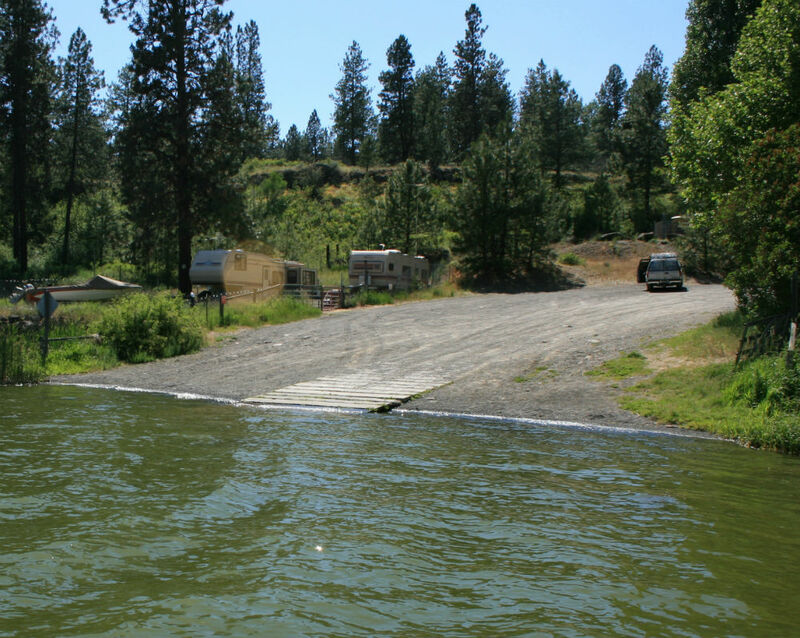 One gravel single lane launch; DIRECT WATER ACCESS… No access for wheeled mobility devices; TRANSFER SYSTEMS... None; CAMPING... primitive space for camping (no hookups), call to verify camping availability. No designed accessible camping sites; O.T.H.E.R… Oddities/Barriers: Deep mud during wet times of the year along shoreline; Terrain: Level to about 5% grades; H2O/Water: Water normally murky. Water temperature in the summer can be around 60 to 70 degree; Environmental Conditions: High winds and hot summer temperatures; Resources: Limited concessions at resort. Food, drinks, and gas in town of Sprague. ACCESSIBILITY: PARKING... Gravel dirt combo parking lot at 3-5% grade; PATHS/TRAILS... None. Large open gravel area on either side of cement launch. Beware of deep mud as you go down toward/into the water; RESTROOMS/FACILITIES… None; SENSORY... No sensory tactile markers for those with visual and other impairments. DOCKS/LAUNCHES/PLATFORMS…One single lane cement grated launch; DIRECT WATER ACCESS… No access for wheeled mobility devices; TRANSFER SYSTEMS... None; CAMPING... None; O.T.H.E.R… Oddities/Barriers: Deep mud during wet times of the year along shoreline; Terrain: Level to about 3-5% grades; H2O/Water: Water normally murky. Water temperature in the summer can be around 60 to 70 degree; Environmental Conditions: High winds and hot summer temperatures; Resources: Limited concessions at resort. Food, drinks, and gas in town of Sprague.